“Operation MAVERICKS was a four-phased operation following the same phase format of Operation SPURS (planning and shaping, insertion and cordon and knock/search, targeted CMO/IO, and sustained stability operations). 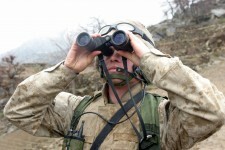 During Phase I the Battalion held planning conferences to coordinate efforts involving SIGINT feeds, completing target [ulders, determining the best time on target based on pattern analysis and aircraft capabilities/limitations, identifying the best LZ to afford tactical advantage and completing the 10 and Civil Affairs (CA) plans for Phase III. Phase I ended as the Battalion staff and attachments positioned for command and control at FOB Jalal Abad and Lima Company staged at FOB Mehtar Lam. 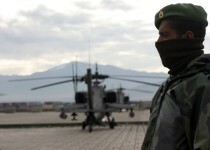 “Phase II of the operation involved the helicopter insertion of Kilo Company (reinforced) along with NAVSOF in the village of Paitak and the ground movement of Lima Company (reinforced) and one KANDAK company into the village of Dawlet Shah, both in northern Laghman. “Initially the operation in Paitak produced eighteen detainees. NAVSOF and the Kilo Marines also located an extensive cave network and systematically cleared it. They also discovered a large arms cache in which they destroyed. 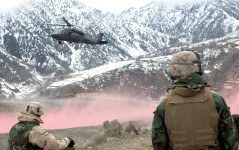 Lima Company’s objective in the south had been affected by severe flooding and became the focus of HA operations initiating Phase III of the operation early in that objective area. Phase III of Operation MAVERICKS was completed when Kilo Company successfully extracted from the northern objective in Paitak after conducting sustained IO, CMO, ami MEDCAP for three additional days. Phase IV of the operation continued with Lima Company working closely with the Governor of Laghman and the Laghman Disaster Response Chief to address needs of the people in and around the southern objectives. 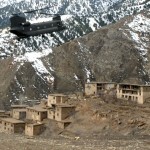 Although the washed out roads and non-availability of aircraft prohibited Lima from reaching Dawlet Shah, the Company’s disaster relief efforts continued to target those displaced from their initial objective areas by the flooding. Specifically, Lima Company erected a tent village for those displaced, built a retaining wall with Commander’s Emergency Response Program (CERP) funds to protect a threatened area, mitigated effects with sand bag details, and provided MEDCAP operations. The Governor of Laghman assessed that these efforts had a significant and productive impact on the people of northern Laghman and did a great deal to extend his reach there. 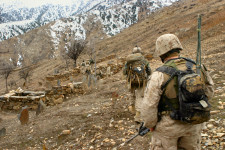 LAGHMAN PROVINCE, Afghanistan, April 5, 2005 — Third Battalion, 3rd Marines, “America’s Battalion,” completed Operation Mavericks this week, successfully rounding up suspected terrorists and confiscating several weapons and explosives caches in the still snow-covered mountains of Eastern Afghanistan. 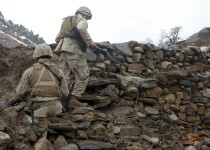 Kilo and Lima companies combined their efforts during the battalion operation, simultaneously pursuing several targets they believed were hiding in the Alishang District of Laghman Province. 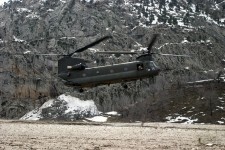 Kilo also worked with Navy Special Operations Forces who shared a third of their objective among the hilltop villages. Both the Navy SEALS and Marines said pooling their resources was mutually beneficial during Mavericks. Many of the SEALS and Marines, having had experience working with the other service as part of a Marine Expeditionary Unit, were able to speak the same operational language, which the Marines said kept the mission focused. “I’ve never seen something go as ‘according-to-plan’ as this did with as many variables as we had,” said Capt. Skyler Mallicoat, Kilo company commander. The Marines were the first Coalition forces many of the villagers had ever encountered. Dealing with the culture shock and keeping everyone calm was essential to the success of the mission. “There are some uncertainties on both sides, among the young Marines who have never experienced this culture before and from the Afghans who see us swoop in on these huge machines and walk around with all our gear,” explained Sgt. Michael Villanueva, Kilo Co. squad leader. The Marines distributed humanitarian assistance supplies to the people of the villages after they had finished their search, and set in for a cold, wet night on the mountainside. Numerous indicators, to include information from sympathetic villagers, gave warning to possible attacks during the night against their position. The Marines waited, but the enemy never appeared. 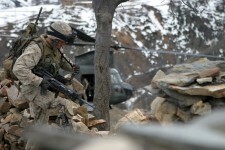 America’s Battalion continues to dig deeper into territory Coalition Forces have yet to breech as the temperature change draws insurgents back into Eastern Afghanistan from their winter hideouts. The Marines will continue their security mission in the coming months as they anticipate an increase in activity from terrorists as the weather improves. Petty Officer Alonzo Gonzales, Laghman Province, Afghanistan. March 2005. Lance Cpl Nicholas Kirven (L) and Pvt First Class Stephen Richardson (R), Laghman Province, Afghanistan. March 2005. Cpl. 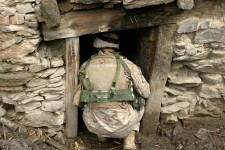 Thomas Stickles, Laghman Province, Afghanistan. March 2005. Cpl. John Pollander, Laghman Province, Afghanistan. March 2005. Cpl. Peter Delach, Laghman Province, Afghanistan. March 2005. Sgt. Robert Campbell, Laghman Province, Afghanistan. March 2005. Lance Cpl. Chris Myles, Laghman Province, Afghanistan. March 2005. Cpls. Thomas Stickles and John Pollander, Laghman Province, Afghanistan. March 2005. Cpl. 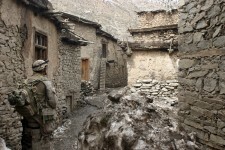 Frank Fischbach, Laghman Province, Afghanistan. March 2005. 1stSgt. Vincent Santiago, Laghman Province, Afghanistan. March 2005.